Say you’ve found a hidden gem on auto mechanics for your greasemonkey friends or want to hop down memory lane with Peter Rabbit and your family. Good news for monkeys and rabbits alike: you can now share info about any of the millions of books in our Google Books index worldwide with your circles on Google+. Let’s say you are reading Alice’s Adventures in Wonderland, and you’d like your friends to read it with you (or you have a witty comment to let loose). 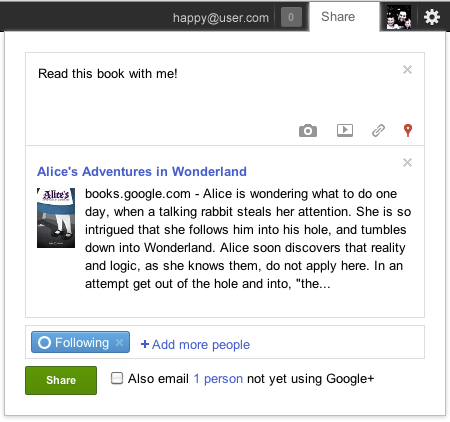 Simply click on the Google+ Share box on the About the Book page or in a Google Books preview, enter your message, then select which circles you’d like to share details about the book with, and click “share”. 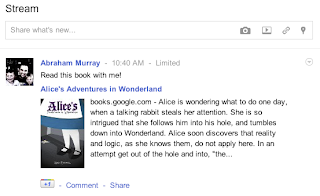 The book cover, description and title linking back to the Google Books About the Book page will appear in your Google+ stream with your message. You can also simply paste the About the Book or Google Books preview URL into your Google+ Share box. This will show the cover and book details, helping your friends know exactly what you’re sharing with them. While you’re sharing books, you can also +1 them, and the titles will appear in your profile on the +1 tab.